Our Summer School Opens it Doors! 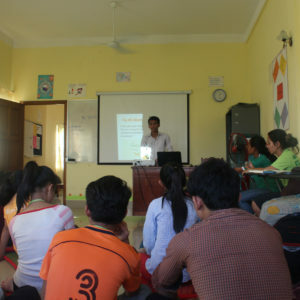 Homepage > PEPY News > Our Summer School Opens it Doors! This year for the first time, PEPY Empowering Youth has opened the doors to a new Summer School project, which offers a 3 month program of ICT, English and Youth Empowerment lessons. Not only can our existing Scholarship students benefit from this new program, but we also gave other young people in Siem Reap the opportunity to apply. The summer months tend to be a bit quieter around PEPY Empowering Youth, with many of our 2nd year Scholarship students taking their first steps into the world of work. However, rather than leave the Learning Center a little emptier than normal, we decided this year to make the most of our facilities and our staff’s knowledge by opening the Summer School. Several weeks ago, an announcement was made via Social Media and other NGOs in Siem Reap, and of course via word-of-mouth, that any students in Siem Reap (of university age and above) could apply for 3 months’ free training in our core subjects of ICT, Youth Empowerment and English. Soon enough, interested applicants started popping up at PEPY HQ and asking for more details. It was really encouraging to see that so many young people in Siem Reap are keen to invest time in building on their skills and learning new ones, as this is what PEPY Empowering Youth is all about! After an English assessment test, on June 2nd we welcomed 12 new students to the Learning Center, ready to embark on a summer of sharing, learning and having fun. Many of the new students, and also our own Scholarship students, have so far had fairly limited access to ICT facilities in their education, so we wanted to provide an opportunity to learn and improve on the basic skills that employers nowadays so often require. Our ICT Officer has devised a schedule that will introduce the students to a range of programs that are essential in the modern working environment, including Microsoft Word, Excel and PowerPoint. Not only that, but participants will also learn how to use email and safely navigate the internet. As we so often he ar nowadays, a good understanding of English is of great importance in the world of work. Many businesses and organisations work on an international level, communicating daily with partners, clients and colleagues who do not all speak the same language. So what language do they speak? More often than not, it’s English. At the PEPY Summer School, the students will have the chance to practice and improve their language skills four times a week, focussing on a mix of grammar, general English practice and more specialist skills, such as writing CVs and cover letters. They are also able to practice their English with native speakers, for example when members of our educational partnership with ETNS in Ireland come to visit in July. Finally, the students will take part in Youth Empowerment classes, which are led by our Scholarship Officer, who is a PEPY Scholarship student himself. While ICT and English are vital for success on the job market, surveys of employers have revealed that they deem there to be a chronic lack of so-called soft skills among young people entering employment. This refers to skills such as team work, leadership, communication, problem-solving and critical thinking. These are exactly the skills about which the students will learn in Youth Empowerment class. The combination of these three subject areas will hopefully give the Summer School participants an extra boost when it comes to applying for jobs or study opportunities in the future. It’s been a great first week at the Summer School and we are sure that there is plenty more learning, sharing and fun to come over the next 3 months! Success Series – Meet Khanya!